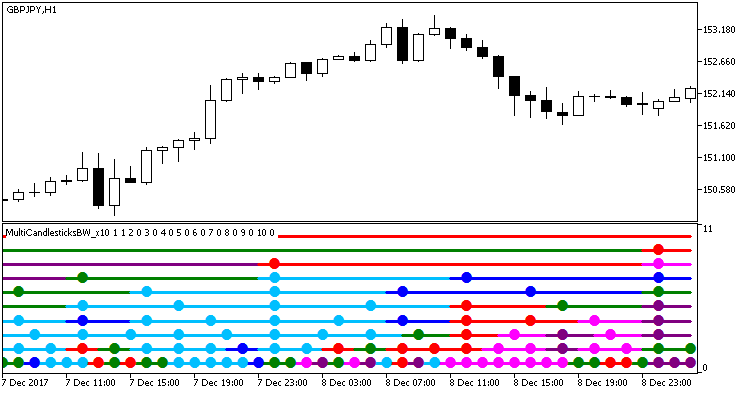 Indicator MultiCandlesticksBW_x10 shows information on the current trends, using the colors of indicator CandlesticksBW from ten different timeframes. Each of the ten indicator lines corresponds to a separate indicator. Colors of the lines and colored points are uniquely defined by the color of the initial indicator candlesticks. Colored points appear on the lines when the bar of the relevant timeframe changes.